The first major storm of the winter rainy season is expected to begin Monday night and drop up to a full inch on San Diego. The National Weather Service office in San Diego said a low pressure system will shift the jet stream south, bringing rain starting Monday afternoon with the heaviest showers on Tuesday. Rainfall in San Diego County is expected to total 0.5 to 1.0 inches, with less in the desert. Forecasters said snow showers are possible above 6,000 feet and accumulation above 7,000 feet. 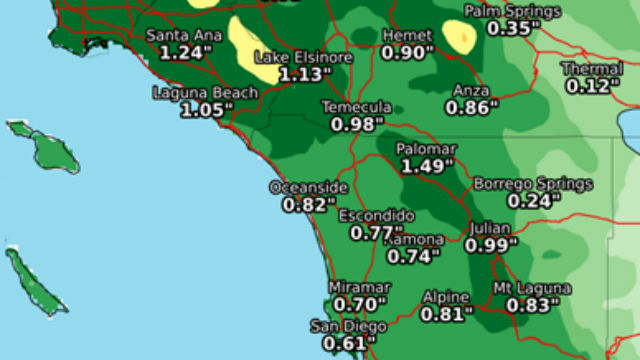 Rainfall totals are expected to be higher north of San Diego County, with up to 3.0 inches in parts of San Bernardino County. The “rain year” that officially began Oct. 1 is the direst on record for San Diego, with just .09 inches of rain to date.